A small, early turned bench in mossy green velvet, likely French. 18 1/2” x 16”, 19 1/2” high. A delicate pair of French, 19th century arm chairs. 17” to seat, 47 1/2” to back. A large Italian walnut cassapanca, or lift-seat bench. Circa 1650-1720. 81” long, 19” to seat, 36 1/2” to back. A pair of iron based mid century stools with swivel tops. 26 1/4” high, 15” square bases. A funky 3-legged metal shop stool. 23 1/4” to seat, 39 1/4” to back. 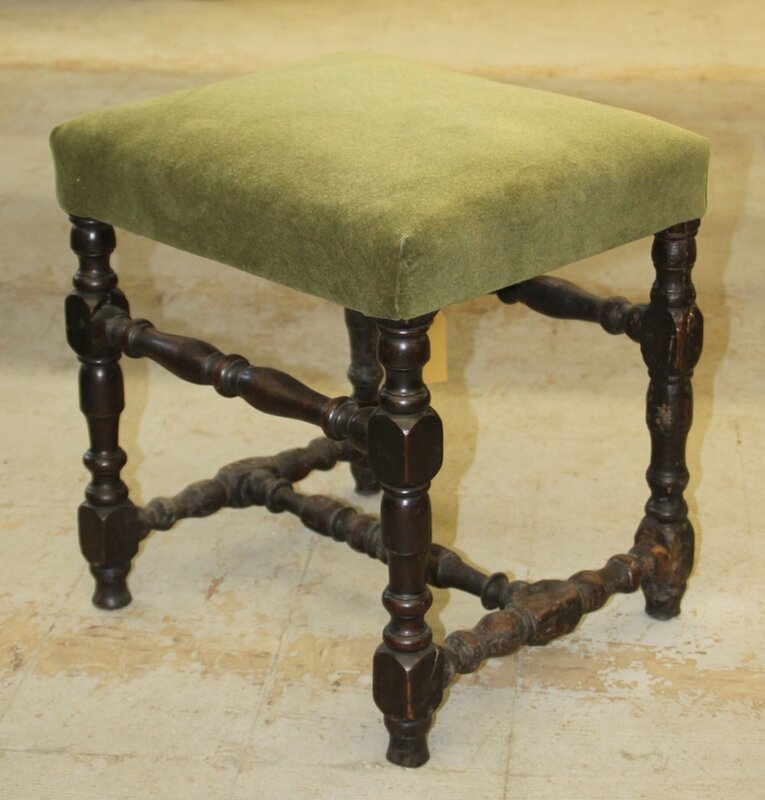 English, 19th century, mahogany library chair in fresh green velvet. 16” to seat, 26” deep, 21 3/4” wide. A pair of English, George III, mahogany side chairs with black leather seats. 19” to seat, 38” to back, 22 1/2” wide. A set of 8 simple, mid century, bentwood dining chairs on skinny chrome legs. 18 3/4” to seat, 17 1/2” wide, 35” to back. A very traditional form of 19th century continental bench in bright green paint. 80” wide, 20” deep, 20” to seat. A curvaceous Thonet bench in old green paint (for indoor use only). 61" long, 18" to seat, 33" to back. A child size 18th century English Windsor chair. 10 1/2" to seat, 24" to back. A pair of french Bergeres with down seats. In need of re-covering. 16" to seat, 35" to back. A wonderful English Regency Mahogany, metamorphic Chair/Library Ladder $3600.